Washington (CNN) -- House Democratic leaders will unveil on Thursday a health care bill that includes a more moderate version of the public option, several Democratic leadership aides tell CNN. This version would allow doctors to negotiate reimbursement rates with the federal government, the aides said Wednesday. The proposal would be a blow to Speaker Nancy Pelosi, who has argued for a more "robust" public option, one that ties reimbursement rates for providers and hospitals to Medicare rates plus a 5 percent increase. 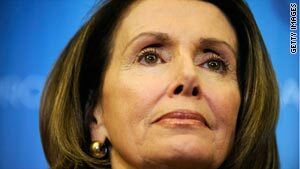 But Pelosi and other Democratic leaders, after a week of canvassing rank and file Democrats, appear to be bowing to the reality that her preferred approach does not have enough votes. Instead, the more moderate version, favored by rural and moderate members, appears to have the most support among House Democrats. One Democratic aide told CNN that "the votes aren't there for robust public option, so that means we're looking at the other form of the public option." House Democratic leaders met Wednesday afternoon to make final decisions. Those leaders invited fellow House Democrats to attend an unveiling of their health care bill at a big event on the West Front of the Capitol Thursday morning, the sources said. Pelosi's office sent out e-mail inviting outside groups to attend a "Health Insurance Reform Event" at 10 a.m. on the West Front. One aide, arguing that despite the step back, the House would still be presenting a strong health reform bill, said, "The overall message is the same as it's been at the beginning. We're committed to a bill with a public option." Democratic leaders expect to get a final cost estimate Thursday from the Congressional Budget Office. Preliminary estimates by the budget office, given to leaders last week, projected that a bill using either version of the public option would come in under the $900 billion cap President Obama has set for the 10-year cost. One thorny issue remaining to be resolved is the final abortion language in the bill. Michigan Democrat Rep. Bart Stupak has been pushing leaders to add stronger language prohibiting the use of federal money to pay for abortions under new health care reforms. He vows that if he isn't allowed a vote on the issue he has the support of 40 anti-abortion Democrats to block the bill from getting to the House floor. Leadership aides admit they still need to find compromise wording on abortion, but are confident the issue will be resolved by the time the bill gets to the floor. House leaders are working to post the text of the final bill online early next week and have agreed to give members 72 hours to read it before a vote. Under this timetable, the House would begin debating a health care bill at the end of next week.